This article is a guide and summary of the work involved in swapping from a JDM 1998 Toyota Supra SZR to an RZ. Basically all steps involved in removing the 2JZGE and putting in a 2JZGTE VVTi, otherwise known as the NA-TT swap. For those that aren’t aware, the SZR came with the A02B torsen diff, 6 speed V161 and carbon fibre steering wheel, with my car it had only done around 50,000km (31,000miles) and was in great condition. 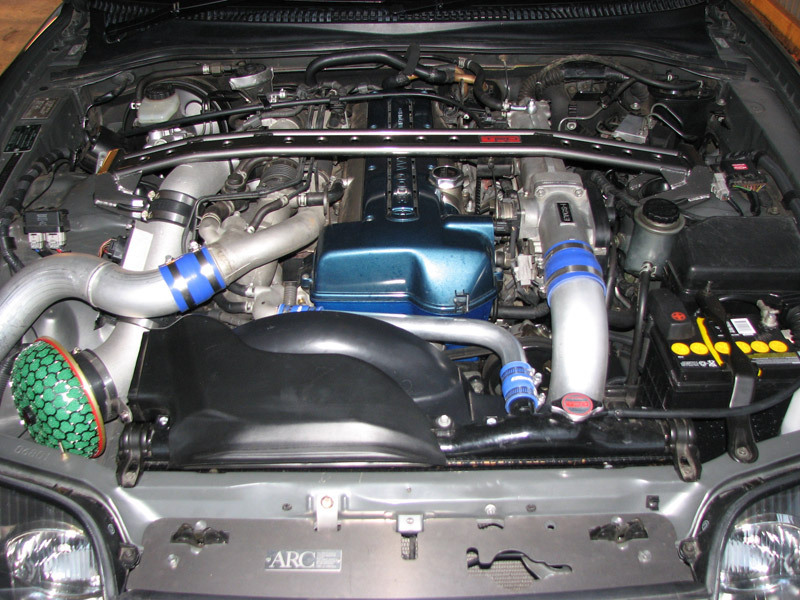 At the time I did not have the budget for an RZ supra at my age and income, I came across a cheap 2JZGTE VVTi engine and thought this was the best opportunity to move to a TT, so I gave the conversion a go way back in 2006! A lot of this information should be similar for a non-vvti supra but there are certain differences with wiring and later model parts. There are lots of different year models, versions (also between countries) and ways you can do this project, it’s almost impossible to list all the variables and document it but hopefully this serves as a general guide. It’s also assumed that you will be referring to the service manual, wiring diagrams and ECU pinouts. I have listed these resources in links below, but will not be mentioning the full details of processes already documented. For those interested in the original supraforums thread, it can be found here – http://www.supraforums.com.au/forum/topic/16967-project-szr-to-tt/ – please do not PM me on the forums, I’m no longer an active member. I always recommend not doing engine/gearbox swaps and buying a supra with the combination of engine and gearbox where possible as it saves lots of headaches and potential issues, but I can understand people swapping engines due to various reasons. I highly recommend buying a supra specific wiring harnesses and ECU as it can get complicated if using different looms from different half-cuts or different models such as the aristo. It’s an ideal time to get an aftermarket ECU for further flexibility. Take the opportunity to do other work to your engine, it’s a perfect time to update the Twin Turbo setup to Single turbo, do other engine modifications or improvements before the swap if you intend to in the future. Do not take shortcuts with cheap parts or tools; don’t lift gearboxes and engines by yourself, always use vehicle stands, safety first! Do not undertake this if you don’t have at least a basic knowledge with the mechanical and wiring aspects of a vehicle, although everyone can learnt, do your own research before asking questions on forums, Facebook and other places. Get some assistance for anything you don’t know how to do or aren’t sure about. It’s been quite a few years since I did the swap so there could be information out of date or potentially missing, let me know in the comments if you notice anything and I will update this article. I take no responsibility in any issues, injury or other problems caused by your actions in conversion, modifications or changes to your car, proceed with care. In Australia if you swap engines it’s a requirement to have an engine of the same or later year model which must also be available in the same chassis (Supra came with 2JZGTE), also it simplifies certain parts of the build.